The course of instruction a student pilot follows depends on the type of certificate sought. It should include the ground and flight training necessary to acquire the knowledge and skills required to safely and efficiently function as a certificated pilot in the selected category and class of aircraft. The specific knowledge and skill areas for each category and class of aircraft are outlined in 14 CFR part 61. Eligibility, aeronautical knowledge, proficiency, and aeronautical requirements can be found in 14 CFR part 61. The knowledge-based portion of training is obtained through FAA handbooks such as this one, textbooks, and other sources of training and testing materials which are available in print form from the Superintendent of Documents, GPO, and online at the Regulatory Support Division: www.faa.gov/about/office_org/headquarters_offices/avs/offices/afs/afs600. The CFI may also use commercial publications as a source of study materials, especially for aircraft categories where government materials are limited. A student pilot should follow the flight instructor’s advice on what and when to study. Planning a definite study program and following it as closely as possible will help in scoring well on the knowledge test. Haphazard or disorganized study habits usually result in an unsatisfactory score. The CFI introduces and demonstrates flight maneuver to the student. The CFI talks the student pilot through the maneuver. The student pilot practices the maneuver under CFI supervision. The CFI authorizes the student pilot to practice the maneuver solo. Once the student pilot has shown proficiency in the required knowledge areas, flight maneuvers, and accrued the required amount of flight hours, the CFI endorses the student pilot logbook, which allows the student pilot to take the written and practical tests for pilot certification. The knowledge test is the computer portion of the tests taken to obtain pilot certification. The test contains questions of the objective, multiple-choice type. This testing method conserves the applicant’s time, eliminates any element of individual judgment in determining grades, and saves time in scoring. FAA Airman Knowledge Test Guides for every type of pilot certificate address most questions you may have regarding the knowledge test process. 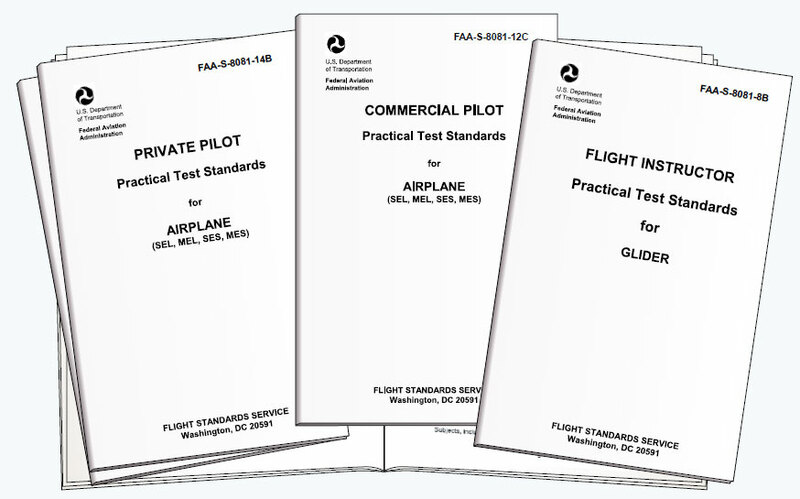 The guides are available on-line (free of charge) at http://www.faa.gov/training_testing/testing/test_guides/. The knowledge test is more meaningful to the applicant and more likely to result in a satisfactory grade if it is taken after beginning the flight portion of the training. Therefore, the FAA recommends the knowledge test be taken after the student pilot has completed a solo cross-country flight. The operational knowledge gained by this experience can be used to the student’s advantage in the knowledge test. The student pilot’s CFI is the best person to determine when the applicant is ready to take the knowledge test. The FAA has developed PTS for FAA pilot certificates and associated ratings. [Figure 1-25] In 2015, the FAA began transitioning to the ACS approach. The ACS is essentially an “enhanced” version of the PTS. It adds taskspecific knowledge and risk management elements to each PTS Area of Operation and Task. The result is a holistic, integrated presentation of specific knowledge, skills, and risk management elements and performance metrics for each Area of Operation and Task The ACS evaluation program will eventually replace the PTS program for evaluating and certifying pilots. Figure 1-25. Examples of Practical Test Standards. The practical tests are administered by FAA ASIs and DPEs. Title 14 CFR part 61 specifies the areas of operation in which knowledge and skill must be demonstrated by the applicant. Since the FAA requires all practical tests be conducted in accordance with the appropriate PTS and the policies set forth in the Introduction section of the PTS book. The pilot applicant should become familiar with this book during training. The flight proficiency maneuvers listed in 14 CFR part 61 are the standard skill requirements for certification. They are outlined in the PTS as “areas of operation.” These are phases of the practical test arranged in a logical sequence within the standard. They begin with preflight preparation and end with postflight procedures. Each area of operation contains “tasks,” which are comprised of knowledge areas, flight procedures, and/or flight maneuvers appropriate to the area of operation. The candidate is required to demonstrate knowledge and proficiency in all tasks for the original issuance of all pilot certificates. 14 CFR part 61 establishes the ground school and flight experience requirements for the type of certification and aircraft selected. However, the CFI best determines when an applicant is qualified for the practical test. A practice practical test is an important step in the flight training process. For a detailed explanation of the required pilot maneuvers and performance standards, refer to the PTS pertaining to the type of certification and aircraft selected. These standards may be downloaded free of charge from the FAA at www.faa.gov. They may also be purchased from the Superintendent of Documents or GPO bookstores. Most airport fixed-base operators and flight schools carry a variety of government publications and charts, as well as commercially published materials. Who Administers the FAA Practical Tests? Due to the varied responsibilities of the FSDOs, practical tests are usually given by DPEs. An applicant should schedule the practical test by appointment to avoid conflicts and wasted time. A list of examiner names can be obtained from the local FSDO. Since a DPE serves without pay from the government for conducting practical tests and processing the necessary reports, the examiner is allowed to charge a reasonable fee. There is no charge for the practical test when conducted by an FAA inspector. To become a CFI, a pilot must meet the provisions of 14 CFR part 61. The FAA places full responsibility for student flight training on the shoulders of the CFI, who is the cornerstone of aviation safety. It is the job of the flight instructor to train the student pilot in all the knowledge areas and teach the skills necessary for the student pilot to operate safely and competently as a certificated pilot in the NAS. The training includes airmanship skills, pilot judgment and decision-making, and good operating practices. A pilot training program depends on the quality of the ground and flight instruction the student pilot receives. The flight instructor must possess a thorough understanding of the learning process, knowledge of the fundamentals of teaching, and the ability to communicate effectively with the student pilot. Use of a structured training program and formal course syllabus is crucial for effective and comprehensive flight training. It should be clear to the student in advance of every lesson what the course of training will involve and the criteria for successful completion. This should include the flight instructor briefing and debriefing the student before and after every lesson. Additionally, scenario-based training has become the preferred method of flight instruction today. This involves presenting the student with realistic flight scenarios and recommended actions for mitigating risk. Insistence on correct techniques and procedures from the beginning of training by the flight instructor ensures that the student pilot develops proper flying habits. Any deficiencies in the maneuvers or techniques must immediately be emphasized and corrected. A flight instructor serves as a role model for the student pilot who observes the flying habits of his or her flight instructor during flight instruction, as well as when the instructor conducts other pilot operations. Thus, the flight instructor becomes a model of flying proficiency for the student who, consciously or unconsciously, attempts to imitate the instructor. For this reason, a flight instructor should observe recognized safety practices, as well as regulations during all flight operations. The student pilot who enrolls in a pilot training program commits considerable time, effort, and expense to achieve a pilot certificate. Students often judge the effectiveness of the flight instructor and the success of the pilot training program based on their ability to pass the requisite FAA practical test. A competent flight instructor stresses to the student that practical tests are a sampling of pilot ability compressed into a short period of time. The goal of a flight instructor is to train the “total” pilot. The Designated Pilot Examiner (DPE) plays an important role in the FAA’s mission of promoting aviation safety by administering FAA practical tests for pilot and Flight Instructor Certificates and associated ratings. Although administering these tests is a responsibility of the ASI, the FAA’s highest priority is making air travel safer by inspecting aircraft that fly in the United States. To satisfy the need for pilot testing and certification services, the FAA delegates certain responsibilities to private individuals who are not FAA employees. Designated to perform specific pilot certification tasks on behalf of the FAA, a DPE may charge a reasonable fee. Generally, a DPE’s authority is limited to accepting applications and conducting practical tests leading to the issuance of specific pilot certificates and/or ratings. The majority of FAA practical tests at the private and commercial pilot levels are administered by DPEs. DPE candidates must have good industry reputations for professionalism, integrity, a demonstrated willingness to serve the public, and must adhere to FAA policies and procedures in certification matters. The FAA expects the DPE to administer practical tests with the same degree of professionalism, using the same methods, procedures, and standards as an FAA ASI.